Cities are great, but if you’re like me, sometimes you want to see a little wildlife (pigeons don’t count). You probably know about Fairmount Park and Pennypack, but there are lots of wild places to explore within a 90-minute drive of Center City. Philly Day Hiker is my attempt at cataloguing them. An interactive map. If I located something awesome—ruins, bald eagle nests, etc—I’ve pinpointed it with a gold marker. Just zoom in. A quick review of each destination, to pass on anything useful I've learned. These reviews are by no means comprehensive (my legs would give out if I tried to hike everything here). A picture of the official trail map, if one exists. Save it to your phone before you head out! Learn something new? Consider leaving a buck or two to help with hosting costs! Wanna help cover our hosting costs and map licenses? You're the best! We accept small tips via PayPal. 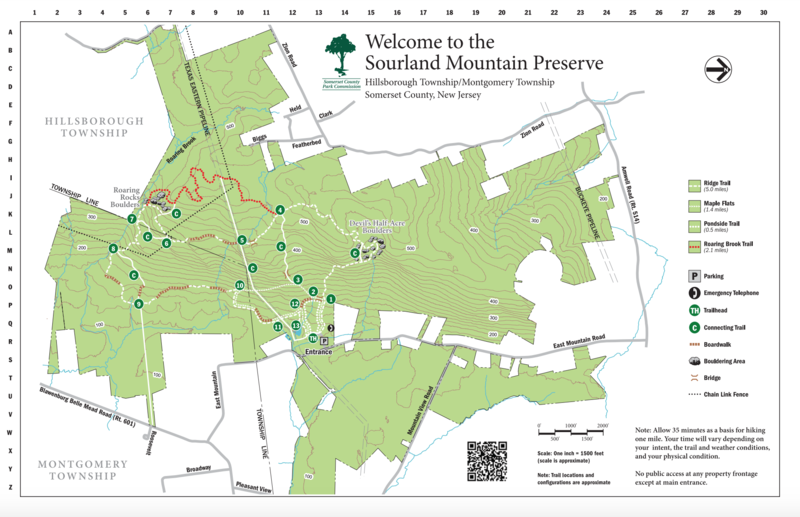 This 4,000-acre preserve in central Jersey offers a refreshing break from the same-old same-old hiking terrain available at most places close to Philly. There are small boulder fields scattered along the trails, here, and at least two are big enough to entertain local rock climbers. And while I wouldn’t call this a “mountain” necessarily, the Ridge and Pipeline trails do provide some decent climbs for those looking for an aerobic hike. Since the Pipeline trail is wide and tree-less, you can steal a bit of a view of the neighborhood from the top. Trails here are well-marked, with several connectors and shortcuts, allowing you to pick the perfect distance for your hike (though you may need to check the map frequently!). The trails at Sourland get very muddy when it has rained recently, so I’d recommend good boots or sticking to the higher-elevation paths. I think I once saw a black bear, here. There are bear warning signs, so I wasn’t totally surprised, but it’s a good reminder to stick to the trails and pay attention. Like this? Tip us a buck or two! Climbing up the trail to the top of the park. A pond near the ridge trail. A cairn guides the way. The trails are very well-marked here. The woods along the ridge trail. The view from the top of the "mountain."